Born in Vienna on November 7, 1878, Meitner studied under LUDWIG BOLTZMANN, who described her as his best, but also his shyest, student. In 1907 she moved to Berlin to study with MAX PLANCK. 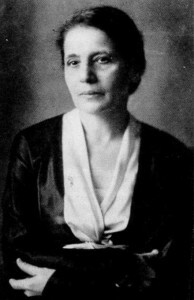 Because of discrimination against women in science, Meitner had difficulty finding work, and Plank had to personally intervene to get her a job at the Chemical Institute in Berlin. There she was teamed with OTTO HAHN, beginning 30 years of friendship and productive collaboration. Together they pioneered the field of radio chemistry, separating and identifying new radioactive elements and isotopes, including the element protactinium in 1918. In the 1930s Italian physicist ENRICO FERMI showed that heavy elements like uranium can capture incoming neutrons, making new heavy atoms. When these atoms decayed, they emitted patterns of radiation that did not correspond to any known heavy atom. Hahn and Meitner began investigating the phenomenon. In 1938 Meitner, who was Jewish, was forced to flee to Sweden to avoid Nazi persecution. Nonetheless Hahn and Meitner continued their research, and in December 1938 they reached the startling conclusion that the uranium atoms were not just swallowing neutrons and growing heavier, but were splitting in two—the radiation did not match the pattern of any heavy atoms because it was from two lighter ones. Hahn and Fritz Strassmann, a young chemist at the Institute, published their result, the discovery of nuclear fission, in January of 1939. Hahn did not include Meitner’s name in the article for fear that it would not be published, or the work recognized, if the Jewish woman’s name appeared in it. Meanwhile, Meitner and her nephew, Otto Frisch, published the results independently a few weeks later. The word “fission” was first used in Meitner’s publication in 1939. Hahn was awarded the Nobel Prize for Physics 1944 for the discovery that he and Meitner had made together. Despite their 30­year friendship, after the war Hahn never mentioned Meitner’s contribution or the leadership she provided to their team. She moved from Stockholm to Cambridge, England, in 1960 and died there on October 27, 1968. Meitner’s legacy rests on her contribution to the discovery of fission, which changed the course of nuclear physics and its application to the real world, in particular to the development of nuclear energy and weapons. While not fully understanding the process of fission she had helped to uncover, Meitner understood its importance. Once in Sweden she sent a message to Danish scientist NIELS BOHR, just as his ship was leaving for America and told him about fission. He understood the results immediately and carried the news to American scientists, who in turn urged President Roosevelt to start a crash program to build a nuclear bomb before the Germans could complete one. President Roosevelt launched the Manhattan Project to undertake the development of an atomic bomb. Bohr, Fermi, and other scientists including John Wheeler of the United States continued investigations into the fission process. Soon fission was understood more fully—particularly the nature of the products of uranium fission including the uranium isotope (uranium 235) and the potential energy released from chain reactions launched during fission events. In 1942 Fermi and a team of physicists under the auspices of the Manhattan Project completed a nuclear reactor to produce the first self ­sustained and controlled fission chain reaction. Three years later, the atomic bombs that the United States dropped on Japan utilized this fission reaction. Today fission has both peaceful and military applications. Nuclear reactors used to generate electrical power are employed worldwide, although new production of these power plants has slowed because of concern about the safety of their operation. Nuclear weapons, most typically hydrogen bombs, use fission along with the process of fusion to generate their huge destructive explosions. In the fusion reaction, atoms of lighter elements “fuse” to form heavier elements, and these reactions are ignited by the heat generated in a fission reaction. As co­discoverer of nuclear fission, Meitner’s contribution to both the peaceful and military uses of these nuclear reactions are undeniable.